I recently finished a white paper comparing the pricing for a new cloud encoding service named Hybrik with multiple cloud providers, including Amazon Elastic Transcoder, Microsoft Azure, Bitmovin, encoding.com, Telestream Cloud, and Zencoder. The white-paper was sponsored by Hybrik, and you can download it below. By way of background, I ran all calculations by the respective services (except Amazon) to verify my calculations, though not all responded. Three of the services have read the entire paper and found no major issues. As I describe in the paper, rather than pricing based upon output GB or minutes, Hybrik charges based upon the number of AWS computers you can use simultaneously. For example, the ability to use 10 cloud computers simultaneously costs $1,000 a month, and you pay all AWS computing costs. You’re free to choose the size of your computer, bid for spot pricing, and set pricing limits. In return, Hybrik takes no markup on your machine use, and the savings are dramatic. Let’s start with the summary numbers, then explore the detail. We based our model on a one-hour project encoded to ten different layers (Table 2) and two different formats (DASH and HLS). I computed prices on volumes ranging from one hour to 1,000 hours a month. Table 1 summarizes pricing for all services. As you’ll learn, Azure is comparatively inexpensive because it’s creating MP4 streams to transmux to HLS/DASH during distribution, rather than the complete DASH/HLS packages. If you’re creating MP4 files only and packaging dynamically, prices for the other services will drop by close to 50%. Table 1: Cost summary by service. Also, encoding.com’s pricing is likely overstated because they share only the lowest tiers of PublicCloud pricing on their web site (and declined to provide additional pricing), and because most of their higher volume customers have already moved to the Reserved Cloud, which utilizes the less expensive, Platform-as-a-Service pricing. Figure 1 graphically displays the comparison data. Figure 1. 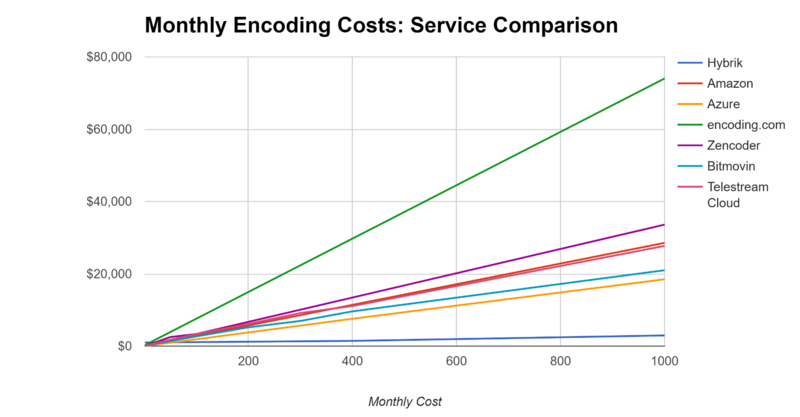 Monthly encoding costs by service. (Author’s note: Several people have asked for contact information at Hybrik — here you go: website: www.hybrik.com, phone: 650-933-5444 and email: info@hybrik.com).